Between 2002 and 2010 Colombia spent $100 billion on defense. That is an average of $12.5 billion per year. For 2011 the amount is about $11 billion. These investments in the war machine made Colombia’s army among the largest in Latin America, on par with Brazil, and among the 15th largest in the world. 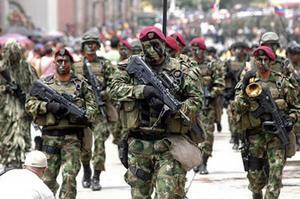 Colombia's armed forces including the country's 160,000 police amounted to 463,149 personnel. Colombian soldiers (militaryphotos.net)The Colombian government spends about 1.5% of its GDP on military salaries. If you combine pensions and other benefits to the armed forces these costs would account for 15%-25% of the Colombian GDP. This wide range is based on the findings of the Commission on the Rationalization of Public Expenditures (Comisión de Racionalización del Gasto Público) and the Ministry of Finance and National Planning's estimates of 1996. At that time military pensions and benefits cost $15 billion a year and covered 360,000 people, including 90,000 already retired pensioned military personnel. In 1996, that $15 billion accounted for 15% of the GDP. Today the numbers of the military personnel have increased significantly, which means more money to pensions, retirement, health care, and other entitlements. This could bring the figure closer to 25% of Colombia's GDP—if not higher. This already huge figure only accounts for the immediate costs of the continuation of the war system and does not tell us much about the hidden and more important longer-term effects of the war on the country’s economic, political development, and income distribution. This military expenditure is a leviathan created by the internal war and its political economy. The core problem lies in how to deconstruct it.